Thanks for your commnets Kaja . Posh hamper is now back on line! After a good nights sleep we were greeted by a splendid breakfast. Freshly baked bread, croissants , local cheeses, cold meats and a selection of homemade jams. The only disappointment was the weather . A fine day had been forecast but we awoke to light rain a drizzle.The colour of the sky appeared to improve over breakfast but the rain did not stop. Our host checked the web cam further up the valley and announced they was clear sky up the valley. We delayed setting off as long as possible but eventually decided to head for Col De Aspin. The waterproof stayed of for the the first few miles but were not required after we stopped for provisions. The road gently climbed to the start of the Col. We were invited as impromptu guests at wedding but had to make our excuses and move on. Just after the turn off for the Col de Aspin the sun came of and stayed out all the way to the top. The first 6km were fairly gentle with the occasion step section but the gradient increased for the last 6km after the ski resort. We eventually made if to the top we a lot of rest stops for Lyn. Photos were taken as it was now 3:30 we sat down to a well deserved picnic lunch. Admiring the view down the valley and the bright sunshine. Windproof tops we put on for the descent. We decided against more suncream and 8km do the valley we were in mist which then into light rain. The 20 mile downhill run to the BB was easy on the legs but we had to stop for an additional layer to keep warm. It had rained at the BB all day. 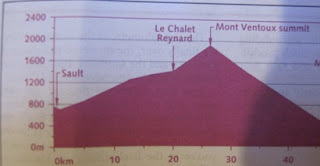 The climb to the top was 950m from Bagneres so would be over 1000m of ascent from the BB. The other couple that are saying tackled the Tourmalet and had excellent views from the top. We are looking forward to tonight evening meal and we are getting the smell of it cooking as we are sat outside updating the blog and diary. Have just caught up whilst experimenting with 'The Old Reader'. Looks like you are having a great time and that you will both be rather plumper on return to the UK!